In late 1941, the famous VW Schwimmwagen Type 166 came into mass production, to become the most numerous amphibious car in the history. 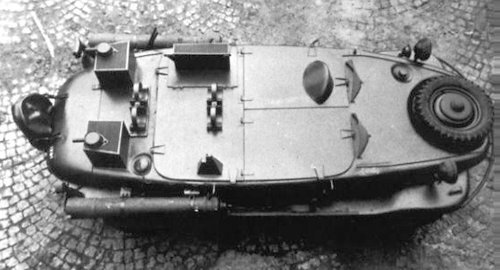 But before that, the small series of 30 Schwimmwagen's Type 128 was built. Unlike the Type 166, which had only 200 cm. wheelbase, the Type 128 was based on the standard All-Wheel-Drive Kubelwagen Type 86 chassis with the wheelbase of 240 cm. That led to the insufficient rigidity, so the Type 128 was not put into mass production. 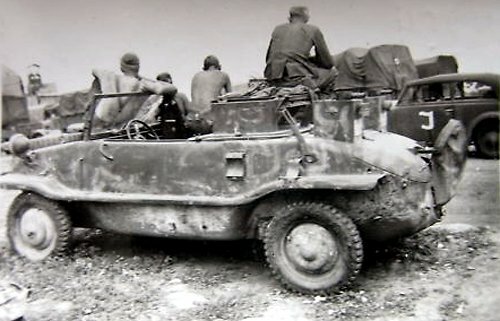 Two Schwimmwagens Typ 128 were converted into so-called Sondertyp 129 by the Porsche company in Stuttgart-Zuffenhausen. VW Schwimmwagen Sondertyp 129 was to be a radio-controlled amphibious demolition drone, but steering wheel was also left intact. The crew compartment was sealed with metal hatches, and the explosive charge was accommodated inside, probably overweighting the vehicle greatly. So, the exhaust mufflers were rearranged into vertical position and shielded with metal boxing - may be, to avoid steam generation in the water. The fuel tank was moved to the back. Sondertyp 129 was to be used to destroy heavily-armored objects on the shores. The problem was that the remote-control operator had no feeling when the vehicle touches the ground. To help the vehicle to get out of the water, up to four rocket-boosters had to be used. Looks like these boosters were Rheinmetall-Borsig RI-502 type (109-502 by RLM designation) - (or similar) - solid fuel, electrically-ignited rockets, used by Luftwaffe as Rocket-Assisted-Take-Off (RATO) boosters for heavy gliders like Gotha Go-242, or even jets like Me-262. One booster delivered thrust of 600 kg. during 6 seconds, so four boosters could lift the Sondertyp 129 off the ground even vertically! 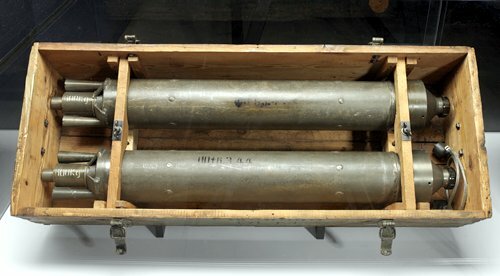 As it was standard to mount two boosters on most aircrafts, these rockets were shipped in pairs, in a special crate. This model kit includes such a crate with a pair of RI-502 boosters. 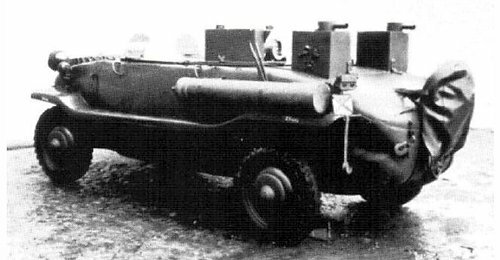 On 8 April 1942, two prototypes of Schwimmwagens Sondertyp 129 were delivered to the Panzer-Versuchs-und-Ersatz-Abteilung 300 (Fkl), which was quite a special division, where different types of experimental vehicles were tested. 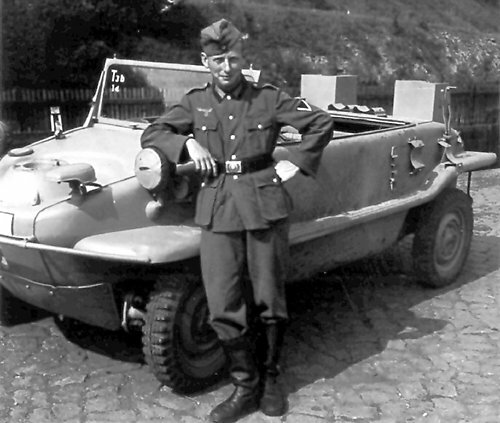 Among them - Sd.Kfz.300 Borgward BI/BII demolition drones, and Borgward "Ente" amphibious radio-controlled self-propelled mine. Note, that unlike the first prototype, the second one had standard windshield and the fuel tank was left in front section of the hood. However, knowing that Panzer-Abteilung 300 was soon relocated to the Crimea peninsula, Russia, where the Siege of Sevastopol took place, it's possible that it was used as it was initially intended. But that's just an assumption.